^ Dean R. Karau (August 2008). 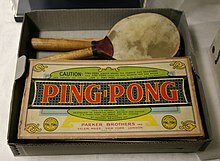 "Are There Any Trademark Rights Left In The Term Ping-Pong?". 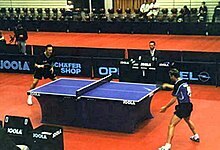 www.fredlaw.com. Fredrikson & Byron, P.A. Archived from the original on 2011-05-30. 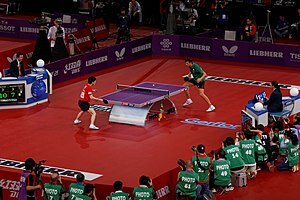 This page is based on the Wikipedia article Table tennis; it is used under the Creative Commons Attribution-ShareAlike 3.0 Unported License (CC-BY-SA). You may redistribute it, verbatim or modified, providing that you comply with the terms of the CC-BY-SA.